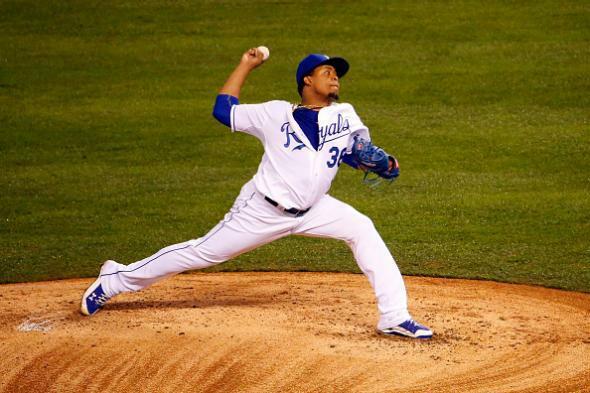 Edinson Volquez didn't learn of father's death until leaving game, Ned Yost says. Edinson Volquez of the Royals pitches during Tuesday’s World Series game against the New York Mets at Kauffman Stadium in Kansas City. According to the Royals, Roandy Volquez, the pitcher’s wife, told General Manager Dayton Moore what had happened and asked him not to tell her husband until after he had finished pitching the biggest game of his career, his first World Series start. The team then asked the broadcasters on Fox not to announce the news, because Volquez routinely goes into the clubhouse between innings, and the broadcasts of the game are usually on. The father of another Royals pitcher who played in last night’s game, Chris Young, died in September, while third baseman Mike Moustakas’ mother died in August. Daniel Volquez, a mechanic, was 63.